Located in the lush, verdant estate of Greenfields, Sai Kung, we today travel to visit an unbelievably inviting residence that utilises a sophisticated combination of minimalism and modern art. This intriguing dwelling is situated in the New Territories district of Hong Kong, and has been lovingly brought to life by the team at Urban Design and Build. Employing a range of different interior design techniques, this 2000 sq. ft home has been revamped and completely transformed from drab, dull, and uninteresting, to fabulously vital, vivacious, and full of life. Within this rather spacious villa, the key consideration for the clients was to ensure the home featured a range of intriguing and visually spectacular art. The vintage aesthetics have been astutely paired with timber furniture, and sumptuous modern textiles. Overwhelmingly, the rooms are a cohesive and contemporary blend of fabulous ethnic and cultural wares. Maintaining a united theme throughout, the abode is awash with rich textures, dramatic hues, and a convivial ambience. Luckily, we are privileged to take a tour inside this strikingly updated and renewed villa. If you would like to gain a little domestic inspiration, and peek inside one of Hong Kong's luxury villas, check out the images below! 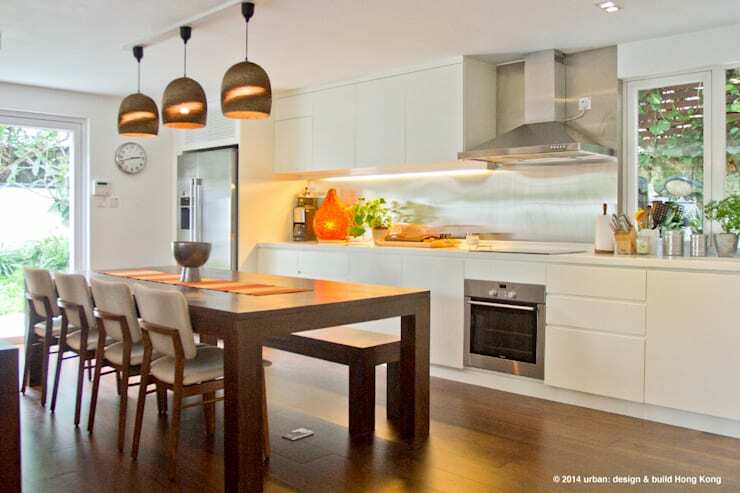 The first image we get of this striking abode is of the stunning kitchen and dining area. This is a multi-purpose space that utilises a juxtaposition of both interior design elements and as well as domestic functions. The dining area is wonderfully situated to work in conjunction with the kitchen and offers the space extra preparation room when the bench seat is tucked away. 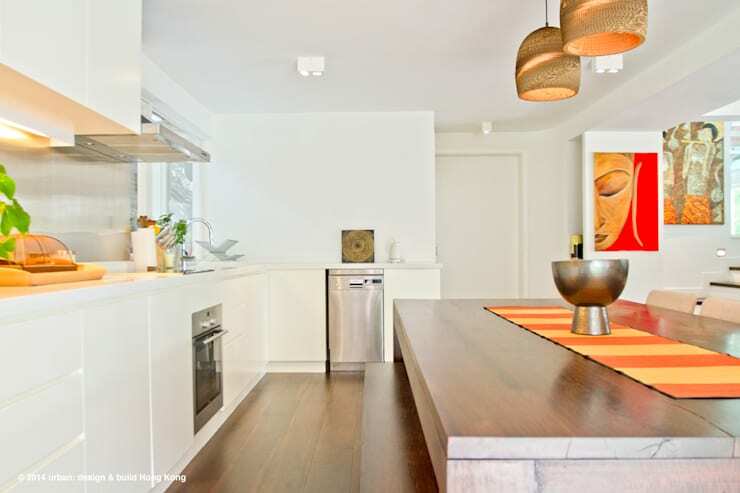 The kitchen itself is a sleek white number with fitting-free joinery, and stainless steel appliances. Employing one entire wall for the cooking area, the kitchen manages to combine an industrial practicality, with chic finishes, and an utterly lavish atmosphere. 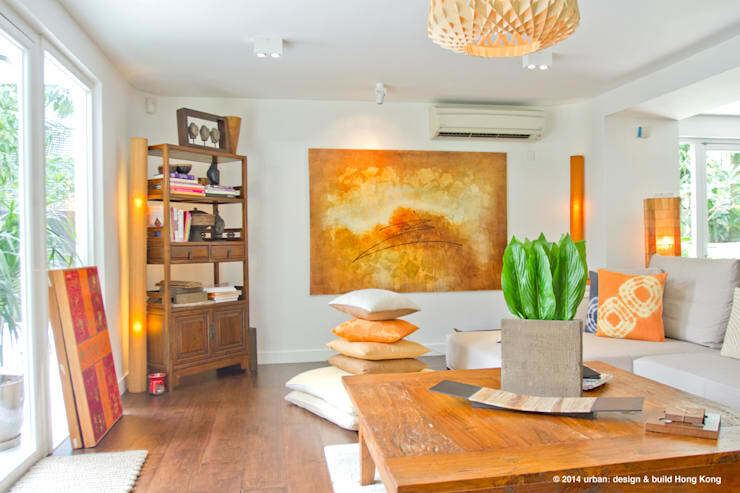 Art is central to the theme and design of this newly renovated home. As a key component in the aesthetics and ambience of the internal spaces, the modern and often abstract art is essential to the success of the overall dwelling. In this image we are given a glimpse into the bright and luxurious living room. This space is evocative of a holiday home, with comfort and relaxation of the utmost concern. In the background of the room, throw cushions adorn the floor space, again adding to the sumptuous and lavish essence of the residence. Peering in from the other direction and we are able to properly view the modular sofa. This piece of furniture is neutral and muted in its colour palette, with tie-dyed throw cushions adding a burst of brightness. Although the furniture is relatively minimal, the delicate design is offset by sturdy timber furniture, such as the coffee table that can be seen in the foreground. On almost every vacant wall there is a piece of bright and lively artwork. This helps to keep the interior domestic spaces fresh and vibrant. With a range of hues employed in this lounge area, it is the bright green plant that stands out as a focal point and attention-grabbing feature. The green contrasts the warm tones within the space and imparts life and energy. 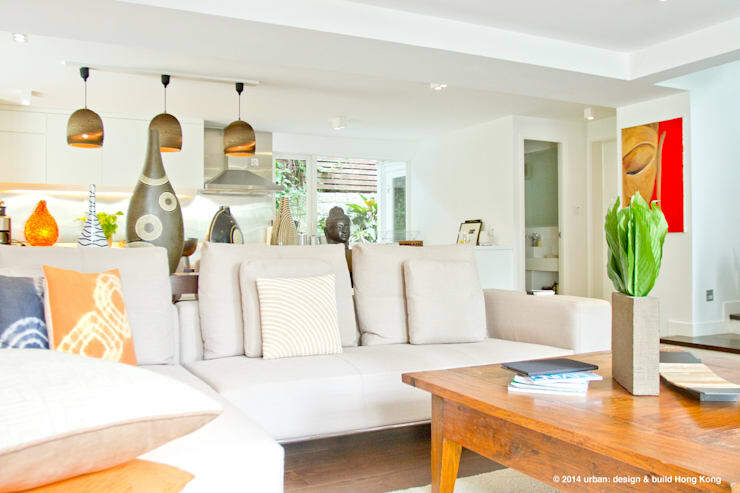 Throughout the villa we see a cohesive design that maximises a bright and eclectic ambience. The predominant hue is a rich blend of oranges, rusty shades, and browns. This gives a truly enjoyable and relaxing vibe, exuding warmth and intriguing elegance. 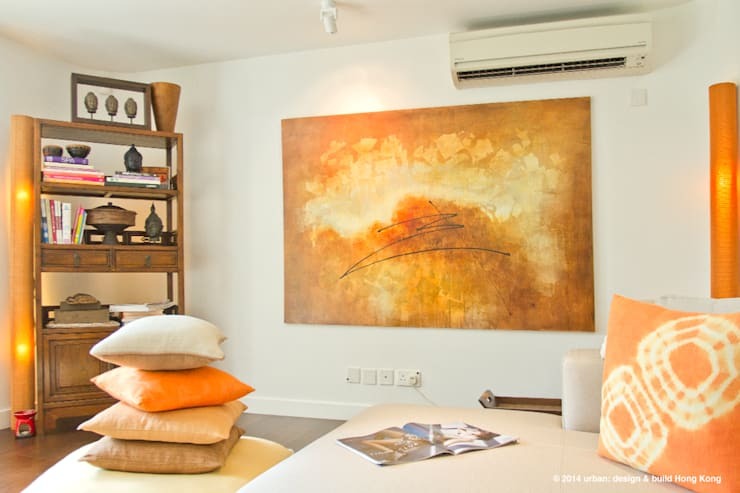 The floor cushions resemble a rock formation, and are beautifully paired with the artwork that sits upon the wall. In the corner of the space there is a freestanding lamp, an oil burner, and a bookshelf filled with curios and gorgeous timber ornamentation. This room is sumptuous, graceful, and perfectly balanced. Within the dining room we see the rich timber table that is a sturdy and rigid inclusion. This dark timber includes a large bench-style seat that can be tucked away under the table and creates a breakfast bar style space for the remaining chairs on the opposite side. The accessories and tableware are a combination of bright orange tones, which pair beautifully with the dark brown timber of the table and floor. The metal bowl coordinates with the appliances, and the drop down pendant lights are effortlessly chic in their shape and form. Within the bedroom, the easy-going and relaxed ambience is continued. Almost nautical in its appearance, the bed includes striped linen that imparts a gorgeously serene aesthetic. The furniture follows suit in that it is sturdy yet unimposing on the space, with art the central feature once again. 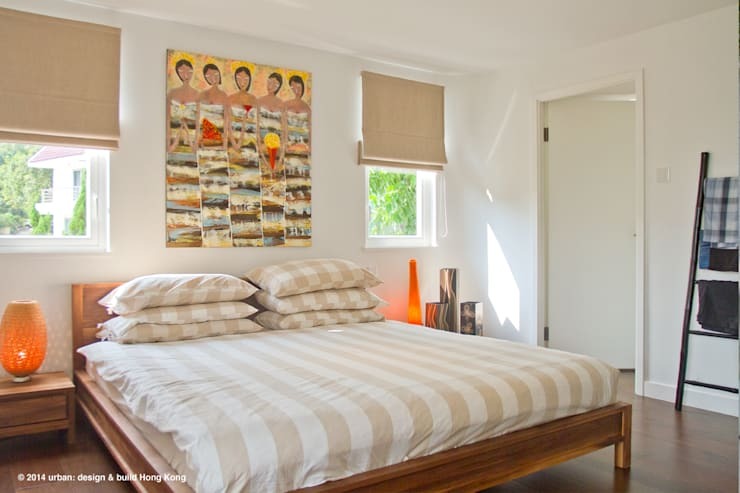 The bright piece that sits above the bed is a beautiful addition and adds to the symmetry of the room. A single ladder sits at the side of the entrance, offering a hanging place for clothing or other items. The lighting is warm and matches the orange shade seen throughout the villa. 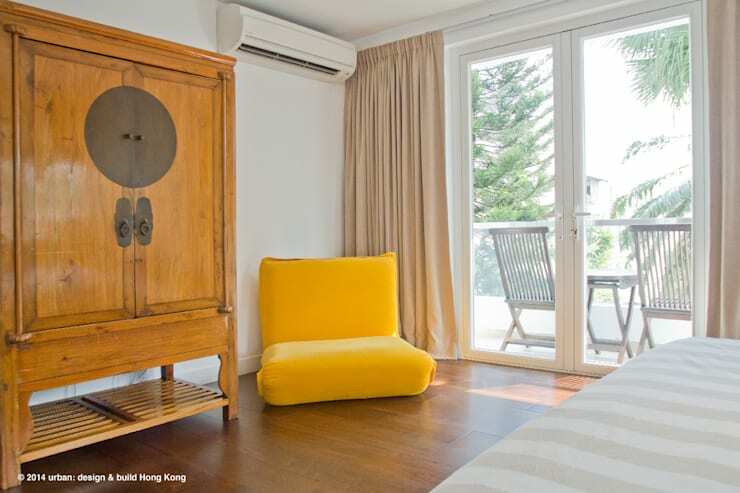 As we take a peek from a different vantage, we see the bright yellow chair that adds a spaciousness to the corner of the bedroom. Yellow is a wonderful way to increase the light within a room, and this has been beautifully exploited by the designers in this instance. Heavy drapes are placed to keep the light out at night and in the morning, while they also provide insulation for the room during both the warmer and cooler months. Additionally, we see another beautifully individual piece of furniture in the left hand side of the room. This cupboard adds storage space, in an intriguing and original way. The room is unique, stylish, and tranquil. Finally, we get a glimpse into the terrace space that has incorporated simple timber seating and a small table; the perfect place to sit and enjoy the lush scenery beyond. As the final image in our tour today, we see a bird's eye view of the outdoor garden space. The seating employed is especially luxurious, imparting an opulence that is reflected throughout other parts of the home. 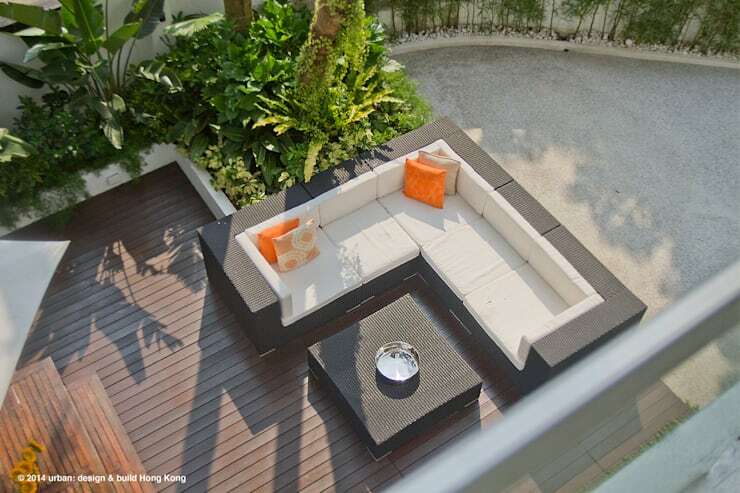 Timber decking provides an all-weather space, while the orange throw cushions bring us back to the interior colour scheme. As well as a planter that features trees with verdant undergrowth, this garden space is ideally set up for entertaining, as well as relaxing on a host and sunny day. This is a truly lavish, comfortable, and inviting garden terrace. Could you live in this villa? Let us know what you loved (or didn't love) in the comments below!